Kabogo vs Waititu: Ferdinand Waititu "Baba Yao" beat William Kabogo in Kiambu county Jubilee Nominations from all constituencies. - Bana Kenya News, Real African Network Tubanane. 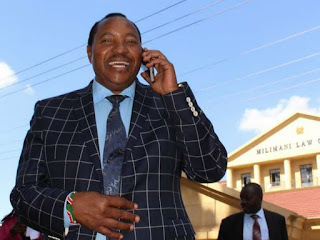 Home News Kabogo vs Waititu: Ferdinand Waititu "Baba Yao" beat William Kabogo in Kiambu county Jubilee Nominations from all constituencies. Kabogo vs Waititu: Ferdinand Waititu "Baba Yao" beat William Kabogo in Kiambu county Jubilee Nominations from all constituencies. Kiambu Governor William Kabogo was defeated by the Kabete MP Ferdinand Waititu at the Kiambu gubernatorial race. The Kabete Mp famously known as Baba yao beat Kabogo with over 10,000 votes. The votes which are remaining are from one Constituency. It is alleged that Juja constituency was Kabogos' stronghold and Baba Yao got more votes that Kabogo. Kabogo conceded defeat as the party officials still counting the votes. The current Governor mocked women and abused them and they vowed to take him home. The words from the women have actualised and Waititu will be heading to the ballot come August 2017. As people were waiting for the results of only Juja constituency Kabogo had 4897 votes while Waititu had 15,467. Kabogo announced to be defeated in the race despite claims that even Waititu beat Kabogo at Juja where it is the governor's hometown.